Paintings by Hannah ‘20, Rachel ’20, and John ‘20 were accepted into the New Hampshire Scholastic Art Awards this year. Of the over 1000 entries, only 475 pieces were selected from which only five pieces received awards. John’s self-portrait “Suffocated” earned an American Visions award and will advance to the national show. 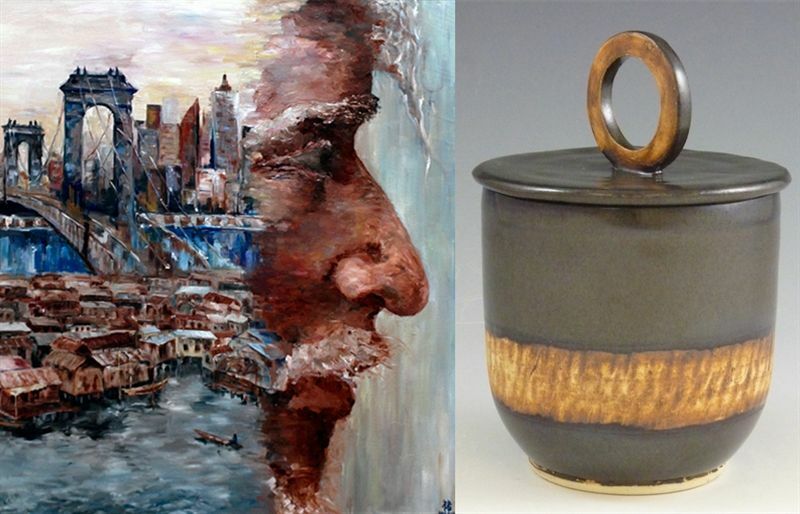 Several student works were accepted into the AVA Gallery Regional High School Show in Lebanon, NH, where John’s winning streak continued, earning the top award in the Painting Category for his large-scale work of a man and a city, and honorable mention for a ceramics piece. Additionally, Alice ’19 earned the award for best environmental art. In the world of ceramics, John, Fiona ‘21, Liam ‘20, and Hyeji ’20 were all admitted to the K-12 National Ceramics Exhibition, an annual juried ceramic competition for K-12 students in the United States. Designed to showcase the best K12 ceramic work made in the country, the exhibition takes place in a different city each year in conjunction with the annual conference of The National Council on Education for the Ceramic Arts (NCECA). Competition was stiff this year with 1164 entries and about 150 accepted into the show. All four KUA students earned recognition in the show; Fiona and Liam won small purchase awards, Hyeji an honorable mention, and John artistic merit.